Search for all "BHLHB3 / BHLHE41"
Mouse anti Human BHLHB3 / BHLHE41 OTI11B5. 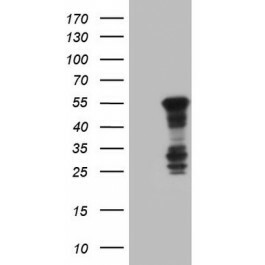 Human recombinant protein fragment corresponding to amino acids 1-297 of human BHLHE41(NP_110389) produced in E.coli. This gene encodes a basic helix-loop-helix protein expressed in various tissues. 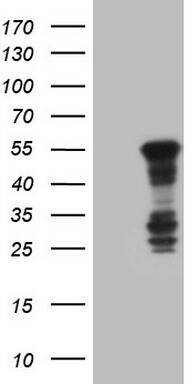 The encoded protein can interact with ARNTL or compete for E-box binding sites in the promoter of PER1 and repress CLOCK/ARNTL's transactivation of PER1. This gene is believed to be involved in the control of circadian rhythm and cell differentiation. Defects in this gene are associated with the short sleep phenotype. [provided by RefSeq, Feb 2014].